If you run a web site, you may already be familiar with Google Webmaster Tools and how it lets you know if Safe Browsing finds something problematic on your site. 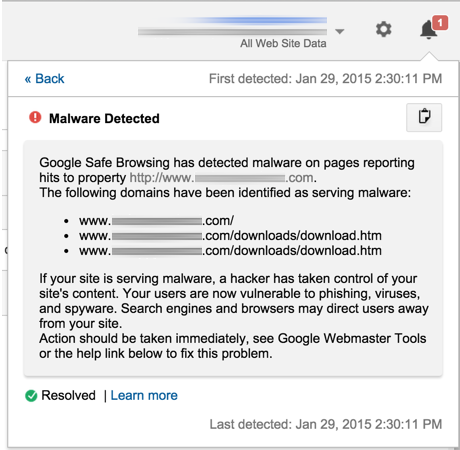 For example, we’ll notify you if your site is delivering malware, which is usually a sign that it’s been hacked. We’re extending our Safe Browsing protections to automatically display notifications to all Google Analytics users via familiar Google Analytics Notifications. Google Safe Browsing has been protecting people across the Internet for over eight years and we're always looking for ways to extend that protection even further. Notifications like these help webmasters like you act quickly to respond to any issues. Fast response helps keep your site—and your visitors—safe. The following was originally posted on the Google Online Security Blog.